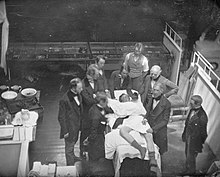 Re-enactment of the first public demonstration of general anesthesia by William T. G. Morton on October 16, 1846 in the Ether Dome at Massachusetts General Hospital, Boston. Surgeons John Collins Warren and Henry Jacob Bigelow are included in this daguerrotype by Southworth & Hawes. Attempts at producing a state of general anesthesia can be traced throughout recorded history in the writings of the ancient Sumerians, Babylonians, Assyrians, Egyptians, Greeks, Romans, Indians, and Chinese. During the Middle Ages, which correspond roughly to what is sometimes referred to as the Islamic Golden Age, scientists and other scholars made significant advances in science and medicine in the Muslim world and Eastern world. In the 20th century, the safety and efficacy of general anesthesia was improved by the routine use of tracheal intubation and other advanced airway management techniques. Significant advances in monitoring and new anesthetic agents with improved pharmacokinetic and pharmacodynamic characteristics also contributed to this trend. Standardized training programs for anesthesiologists and nurse anesthetists emerged during this period. The increased application of economic and business administration principles to health care in the late 20th and early 21st centuries led to the introduction of management practices such as transfer pricing to improve the efficiency of anesthetists. The word “anesthesia”, coined by Oliver Wendell Holmes (1809–1894) in 1846 from the Greek ἀν-, an-, “without”; and αἴσθησις, aisthēsis, “sensation”, refers to the inhibition of sensation. The Sumerians are said to have cultivated and harvested the opium poppy (Papaver somniferum) in lower Mesopotamia as early as 3400 BC, though this has been disputed. The most ancient testimony concerning the opium poppy found to date was inscribed in cuneiform script on a small white clay tablet at the end of the third millennium BC. This tablet was discovered in 1954 during excavations at Nippur, and is currently kept at the University of Pennsylvania Museum of Archaeology and Anthropology. Deciphered by Samuel Noah Kramer and Martin Leve, it is considered to be the most ancient pharmacopoeia in existence. Some Sumerian tablets of this era have an ideogram inscribed upon them, “hul gil”, which translates to “plant of joy”, believed by some authors to refer to opium. The term gil is still used for opium in certain parts of the world. The Sumerian goddess Nidaba is often depicted with poppies growing out of her shoulders. About 2225 BC, the Sumerian territory became a part of the Babylonian empire. Knowledge and use of the opium poppy and its euphoric effects thus passed to the Babylonians, who expanded their empire eastwards to Persia and westwards to Egypt, thereby extending its range to these civilizations. British archaeologist and cuneiformist Reginald Campbell Thompson writes that opium was known to the Assyrians in the 7th century BC. The term “Arat Pa Pa” occurs in the Assyrian Herbal, a collection of inscribed Assyrian tablets dated to c. 650 BC. According to Thompson, this term is the Assyrian name for the juice of the poppy and it may be the etymological origin of the Latin “papaver“. The ancient Egyptians had some surgical instruments, as well as crude analgesics and sedatives, including possibly an extract prepared from the mandrake fruit. The use of preparations similar to opium in surgery is recorded in the Ebers Papyrus, an Egyptian medical papyrus written in the Eighteenth dynasty. However, it is questionable whether opium itself was known in ancient Egypt. The Greek gods Hypnos (Sleep), Nyx (Night), and Thanatos (Death) were often depicted holding poppies. Prior to the introduction of opium to ancient India and China, these civilizations pioneered the use of cannabis incense and aconitum. c. 400 BC, the Sushruta Samhita (a text from the Indian subcontinent on ayurvedic medicine and surgery) advocates the use of wine with incense of cannabis for anesthesia. By the 8th century AD, Arab traders had brought opium to India and China. Bian Que (Chinese: 扁鵲, Wade–Giles: Pien Ch’iao, c. 300 BC) was a legendary Chinese internist and surgeon who reportedly used general anesthesia for surgical procedures. It is recorded in the Book of Master Han Fei (c. 250 BC), the Records of the Grand Historian (c. 100 BC), and the Book of Master Lie (c. AD 300) that Bian Que gave two men, named “Lu” and “Chao”, a toxic drink which rendered them unconscious for three days, during which time he performed a gastrostomy upon them. Hua Tuo (Chinese:華佗， c. AD 145–220) was a Chinese surgeon of the 2nd century AD. According to the Records of Three Kingdoms (c. AD 270) and the Book of the Later Han (c. AD 430), Hua Tuo performed surgery under general anesthesia using a formula he had developed by mixing wine with a mixture of herbal extracts he called mafeisan (麻沸散). Hua Tuo reportedly used mafeisan to perform even major operations such as resection of gangrenous intestines. Before the surgery, he administered an oral anesthetic potion, probably dissolved in wine, in order to induce a state of unconsciousness and partial neuromuscular blockade. The exact composition of mafeisan, similar to all of Hua Tuo’s clinical knowledge, was lost when he burned his manuscripts, just before his death. The composition of the anesthetic powder was not mentioned in either the Records of Three Kingdoms or the Book of the Later Han. Because Confucian teachings regarded the body as sacred and surgery was considered a form of body mutilation, surgery was strongly discouraged in ancient China. Because of this, despite Hua Tuo’s reported success with general anesthesia, the practice of surgery in ancient China ended with his death. Others have suggested the potion may have also contained hashish, bhang, shang-luh, or opium. Victor H. Mair wrote that mafei “appears to be a transcription of some Indo-European word related to “morphine”.” Some authors believe that Hua Tuo may have discovered surgical analgesia by acupuncture, and that mafeisan either had nothing to do with or was simply an adjunct to his strategy for anesthesia. Many physicians have attempted to re-create the same formulation based on historical records but none have achieved the same clinical efficacy as Hua Tuo’s. In any event, Hua Tuo’s formula did not appear to be effective for major operations. Arabic and Persian physicians may have been among the first to utilize oral as well as inhaled anesthetics. Ferdowsi (940–1020) was a Persian poet who lived in the Abbasid Caliphate. In Shahnameh, his national epic poem, Ferdowsi described a caesarean section performed on Rudaba. A special wine prepared by a Zoroastrian priest was used as an anesthetic for this operation. Although Shahnameh is fictional, the passage nevertheless supports the idea that general anesthesia had at least been described in ancient Persia, even if not successfully implemented. In 1000, Abu al-Qasim al-Zahrawi (936–1013), an Arab physician described as the father of surgery. who lived in Al-Andalus, published the 30-volume Kitab al-Tasrif, the first illustrated work on surgery. In this book, he wrote about the use of general anesthesia for surgery. c. 1020, Ibn Sīnā (980–1037) described the use of inhaled anesthesia in The Canon of Medicine. The Canon described the “soporific sponge”, a sponge imbued with aromatics and narcotics, which was to be placed under a patient’s nose during surgical operations. Ibn Zuhr (1091–1161) was another Arab physician from Al-Andalus. In his 12th century medical textbook Al-Taisir, Ibn Zuhr describes the use of general anesthesia. These three physicians were among many who performed operations under inhaled anesthesia with the use of narcotic-soaked sponges. Opium made its way from Asia Minor to all parts of Europe between the 10th and 13th centuries. Throughout 1200–1500 A.D. in England, a potion called dwale was used as an anesthetic. This alcohol-based mixture contained bile, opium, lettuce, bryony, henbane, hemlock and vinegar. Surgeons roused them by rubbing vinegar and salt on their cheekbones. One can find records of dwale in numerous literary sources, including Shakespeare’s Hamlet, and the John Keats poem “Ode to a Nightingale“. In the 13th century, we have the first prescription of the “spongia soporifica”—a sponge soaked in the juices of unripe mulberry, flax, mandragora leaves, ivy, lettuce seeds, lapathum, and hemlock with hyoscyamus. After treatment and/or storage, the sponge could be heated and the vapors inhaled with anasthetic effect. Alchemist Ramon Llull has been credited with discovering diethyl ether in 1275. Aureolus Theophrastus Bombastus von Hohenheim (1493–1541), better known as Paracelsus, discovered the analgesic properties of diethyl ether around 1525. It was first synthesized in 1540 by Valerius Cordus, who noted some of its medicinal properties. He called it oleum dulce vitrioli, a name that reflects the fact that it is synthesized by distilling a mixture of ethanol and sulfuric acid (known at that time as oil of vitriol). August Sigmund Frobenius gave the name Spiritus Vini Æthereus to the substance in 1730. Satirical cartoon by James Gillray showing a Royal Institution lecture, with Humphry Davy holding the bellows and Count Rumford looking on at extreme right. Joseph Priestley (1733–1804) was an English polymath who discovered nitrous oxide, nitric oxide, ammonia, hydrogen chloride and (along with Carl Wilhelm Scheele and Antoine Lavoisier) oxygen. Beginning in 1775, Priestley published his research in Experiments and Observations on Different Kinds of Air, a six-volume work. The recent discoveries about these and other gases stimulated a great deal of interest in the European scientific community. Thomas Beddoes (1760–1808) was an English philosopher, physician and teacher of medicine, and like his older colleague Priestley, was also a member of the Lunar Society of Birmingham. With an eye toward making further advances in this new science as well as offering treatment for diseases previously thought to be untreatable (such as asthma and tuberculosis), Beddoes founded the Pneumatic Institution for inhalation gas therapy in 1798 at Dowry Square in Clifton, Bristol. Beddoes employed chemist and physicist Humphry Davy (1778–1829) as superintendent of the institute, and engineer James Watt (1736–1819) to help manufacture the gases. Other members of the Lunar Society such as Erasmus Darwin and Josiah Wedgwood were also actively involved with the institute. Takamine Tokumei from Shuri, Ryūkyū Kingdom, is reported to have made a general anesthesia in 1689 in the Ryukyus, now known as Okinawa. He passed on his knowledge to the Satsuma doctors in 1690 and to Ryūkyūan doctors in 1714. The reader will note that five of these seven ingredients were thought to be elements of Hua Tuo’s anesthetic potion, 1600 years earlier. Some sources claim that Angelica archangelica (often referred to as garden angelica, holy ghost, or wild celery) was also an ingredient. The active ingredients in tsūsensan are scopolamine, hyoscyamine, atropine, aconitine and angelicotoxin. When consumed in sufficient quantity, tsūsensan produces a state of general anesthesia and skeletal muscle paralysis. Shutei Nakagawa (1773–1850), a close friend of Hanaoka, wrote a small pamphlet titled “Mayaku-ko” (“narcotic powder”) in 1796. Although the original manuscript was lost in a fire in 1867, this brochure described the current state of Hanaoka’s research on general anesthesia. On 13 October 1804, Hanaoka performed a partial mastectomy for breast cancer on a 60-year-old woman named Kan Aiya, using tsūsensan as a general anesthetic. This is generally regarded today as the first reliable documentation of an operation to be performed under general anesthesia. Hanaoka went on to perform many operations using tsūsensan, including resection of malignant tumors, extraction of bladder stones, and extremity amputations. Before his death in 1835, Hanaoka performed more than 150 operations for breast cancer. Henry Hill Hickman (1800–1830) experimented with the use of carbon dioxide as an anesthetic in the 1820s. He would make the animal insensible, effectively via almost suffocating it with carbon dioxide, then determine the effects of the gas by amputating one of its limbs. In 1824, Hickman submitted the results of his research to the Royal Society in a short treatise titled Letter on suspended animation: with the view of ascertaining its probable utility in surgical operations on human subjects. The response was an 1826 article in The Lancet titled “Surgical Humbug” that ruthlessly criticised his work. Hickman died four years later at age 30. Though he was unappreciated at the time of his death, his work has since been positively reappraised and he is now recognised as one of the fathers of anesthesia. By the late 1830s, Humphry Davy’s experiments had become widely publicized within academic circles in the northeastern United States. Wandering lecturers would hold public gatherings, referred to as “ether frolics”, where members of the audience were encouraged to inhale diethyl ether or nitrous oxide to demonstrate the mind-altering properties of these agents while providing much entertainment to onlookers. Four notable men participated in these events and witnessed the use of ether in this manner. They were William Edward Clarke (1819–1898), Crawford W. Long (1815–1878), Horace Wells (1815–1848), and William T. G. Morton (1819–1868). Crawford W. Long was a physician and pharmacist practicing in Jefferson, Georgia in the mid-19th century. During his time as a student at the University of Pennsylvania School of Medicine in the late 1830s, he had observed and probably participated in the ether frolics that had become popular at that time. At these gatherings, Long observed that some participants experienced bumps and bruises, but afterward had no recall of what had happened. He postulated that diethyl ether produced pharmacologic effects similar to those of nitrous oxide. On 30 March 1842, he administered diethyl ether by inhalation to a man named James Venable, in order to remove a tumor from the man’s neck. Long later removed a second tumor from Venable, again under ether anesthesia. He went on to employ ether as a general anesthetic for limb amputations and parturition. Long, however, did not publish his experience until 1849, thereby denying himself much of the credit he deserved. On 30 September 1846, Morton administered diethyl ether to Eben Frost, a music teacher from Boston, for a dental extraction. Two weeks later, Morton became the first to publicly demonstrate the use of diethyl ether as a general anesthetic at Massachusetts General Hospital, in what is known today as the Ether Dome. On 16 October 1846, John Collins Warren removed a tumor from the neck of a local printer, Edward Gilbert Abbott. Upon completion of the procedure, Warren reportedly quipped, “Gentlemen, this is no humbug.” News of this event rapidly traveled around the world. Robert Liston performed the first amputation in December of that year. Morton published his experience soon after. Harvard University professor Charles Thomas Jackson (1805–1880) later claimed that Morton stole his idea; Morton disagreed and a lifelong dispute began. For many years, Morton was credited as being the pioneer of general anesthesia in the Western hemisphere, despite the fact that his demonstration occurred four years after Long’s initial experience. Long later petitioned William Crosby Dawson (1798–1856), a United States Senator from Georgia at that time, to support his claim on the floor of the United States Senate as the first to use ether anesthesia. In 1880, the Scottish surgeon William Macewen (1848–1924) reported on his use of orotracheal intubation as an alternative to tracheotomy to allow a patient with glottic edema to breathe, as well as in the setting of general anesthesia with chloroform. All previous observations of the glottis and larynx (including those of Manuel García, Wilhelm Hack and Macewen) had been performed under indirect vision (using mirrors) until 23 April 1895, when Alfred Kirstein (1863–1922) of Germany first described direct visualization of the vocal cords. Kirstein performed the first direct laryngoscopy in Berlin, using an esophagoscope he had modified for this purpose; he called this device an autoscope. The death of Emperor Frederick III (1831–1888) may have motivated Kirstein to develop the autoscope. The 20th century saw the transformation of the practices of tracheotomy, endoscopy and non-surgical tracheal intubation from rarely employed procedures to essential components of the practices of anesthesia, critical care medicine, emergency medicine, gastroenterology, pulmonology and surgery. In 1902, Hermann Emil Fischer (1852–1919) and Joseph von Mering (1849–1908) discovered that diethylbarbituric acid was an effective hypnotic agent. Also called barbital or Veronal (the trade name assigned to it by Bayer Pharmaceuticals), this new drug became the first commercially marketed barbiturate; it was used as a treatment for insomnia from 1903 until the mid-1950s. Until 1913, oral and maxillofacial surgery was performed by mask inhalation anesthesia, topical application of local anesthetics to the mucosa, rectal anesthesia, or intravenous anesthesia. While otherwise effective, these techniques did not protect the airway from obstruction and also exposed patients to the risk of pulmonary aspiration of blood and mucus into the tracheobronchial tree. In 1913, Chevalier Jackson (1865–1958) was the first to report a high rate of success for the use of direct laryngoscopy as a means to intubate the trachea. Jackson introduced a new laryngoscope blade that had a light source at the distal tip, rather than the proximal light source used by Kirstein. This new blade incorporated a component that the operator could slide out to allow room for passage of an endotracheal tube or bronchoscope. Also in 1913, Henry H. Janeway (1873–1921) published results he had achieved using a laryngoscope he had recently developed. An American anesthesiologist practicing at Bellevue Hospital in New York City, Janeway was of the opinion that direct intratracheal insufflation of volatile anesthetics would provide improved conditions for otolaryngologic surgery. With this in mind, he developed a laryngoscope designed for the sole purpose of tracheal intubation. Similar to Jackson’s device, Janeway’s instrument incorporated a distal light source. Unique, however, was the inclusion of batteries within the handle, a central notch in the blade for maintaining the tracheal tube in the midline of the oropharynx during intubation and a slight curve to the distal tip of the blade to help guide the tube through the glottis. The success of this design led to its subsequent use in other types of surgery. Janeway was thus instrumental in popularizing the widespread use of direct laryngoscopy and tracheal intubation in the practice of anesthesiology. Sodium thiopental, the first intravenous anesthetic, was synthesized in 1934 by Ernest H. Volwiler (1893–1992) and Donalee L. Tabern (1900–1974), working for Abbott Laboratories. It was first used in humans on 8 March 1934 by Ralph M. Waters in an investigation of its properties, which were short-term anesthesia and surprisingly little analgesia. Three months later, John Silas Lundy started a clinical trial of thiopental at the Mayo Clinic at the request of Abbott Laboratories. Volwiler and Tabern were awarded U.S. Patent No. 2,153,729 in 1939 for the discovery of thiopental, and they were inducted into the National Inventors Hall of Fame in 1986. In 1939, the search for a synthetic substitute for atropine culminated serendipitously in the discovery of meperidine, the first opiate with a structure altogether different from that of morphine. This was followed in 1947 by the widespread introduction of methadone, another structurally unrelated compound with pharmacological properties similar to those of morphine. After World War I, further advances were made in the field of intratracheal anesthesia. Among these were those made by Sir Ivan Whiteside Magill (1888–1986). Working at the Queen’s Hospital for Facial and Jaw Injuries in Sidcup with plastic surgeon Sir Harold Gillies (1882–1960) and anesthetist E. Stanley Rowbotham (1890–1979), Magill developed the technique of awake blind nasotracheal intubation. Magill devised a new type of angulated forceps (the Magill forceps) that are still used today to facilitate nasotracheal intubation in a manner that is little changed from Magill’s original technique. Other devices invented by Magill include the Magill laryngoscope blade, as well as several apparatuses for the administration of volatile anesthetic agents. The Magill curve of an endotracheal tube is also named for Magill. The first hospital anesthesia department was established at the Massachusetts General Hospital in 1936, under the leadership of Henry K. Beecher (1904–1976). Beecher, who received his training in surgery, had no previous experience in anesthesia. Sir Robert Reynolds Macintosh (1897–1989) achieved significant advances in techniques for tracheal intubation when he introduced his new curved laryngoscope blade in 1943. The Macintosh blade remains to this day the most widely used laryngoscope blade for orotracheal intubation. In 1949, Macintosh published a case report describing the novel use of a gum elastic urinary catheter as an endotracheal tube introducer to facilitate difficult tracheal intubation. Inspired by Macintosh’s report, P. Hex Venn (who was at that time the anesthetic advisor to the British firm Eschmann Bros. & Walsh, Ltd.) set about developing an endotracheal tube introducer based on this concept. Venn’s design was accepted in March 1973, and what became known as the Eschmann endotracheal tube introducer went into production later that year. The material of Venn’s design was different from that of a gum elastic bougie in that it had two layers: a core of tube woven from polyester threads and an outer resin layer. This provided more stiffness but maintained the flexibility and the slippery surface. Other differences were the length (the new introducer was 60 cm (24 in), which is much longer than the gum elastic bougie) and the presence of a 35° curved tip, permitting it to be steered around obstacles. Many new intravenous and inhalational anesthetics were developed and brought into clinical use during the second half of the 20th century. Paul Janssen (1926–2003), the founder of Janssen Pharmaceutica, is credited with the development of over 80 pharmaceutical compounds. Janssen synthesized nearly all of the butyrophenone class of antipsychotic agents, beginning with haloperidol (1958) and droperidol (1961). These agents were rapidly integrated into the practice of anesthesia. In 1960, Janssen’s team synthesized fentanyl, the first of the piperidinone-derived opioids. Fentanyl was followed by sufentanil (1974), alfentanil (1976), carfentanil (1976), and lofentanil (1980). Janssen and his team also developed etomidate (1964), a potent intravenous anesthetic induction agent. The concept of using a fiberoptic endoscope for tracheal intubation was introduced by Peter Murphy, an English anesthetist, in 1967. By the mid-1980s, the flexible fiberoptic bronchoscope had become an indispensable instrument within the pulmonology and anesthesia communities. 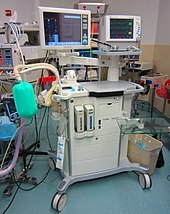 A modern anaesthetic machine. This particular machine is a “Flow-I” model, manufactured by Maquet. The “digital revolution” of the 21st century has brought newer technology to the art and science of tracheal intubation. Several manufacturers have developed video laryngoscopes which employ digital technology such as the complementary metal–oxide semiconductor active pixel sensor (CMOS APS) to generate a view of the glottis so that the trachea may be intubated. The Glidescope video laryngoscope is one example of such a device. Xenon has recently been approved in some jurisdictions as an anaesthetic agent which does not act as a greenhouse gas. ^ Kuntz, L; Vera, A (July–September 2005). “Transfer pricing in hospitals and efficiency of physicians: the case of anesthesia services”. Health Care Management Review. 30 (3): 262–69. doi:10.1097/00004010-200507000-00010. PMID 16093892. ^ Powell MA (2004). “9: Wine and the vine in ancient Mesopotamia: the cuneiform evidence”. In McGovern PE, Fleming SJ, Katz SH. The Origins and Ancient History of Wine. Food and Nutrition in History and Anthropology. 11 (1 ed.). Amsterdam: Taylor & Francis. pp. 96–124. ISBN 9780203392836. ISSN 0275-5769. Retrieved 2010-09-15. ^ Booth M (1996). “The discovery of dreams”. Opium: A History. London: Simon & Schuster, Ltd. p. 15. ISBN 978-0-312-20667-3. Retrieved 2010-09-18. ^ Krikorian, AD (March 1975). “Were the opium poppy and opium known in the ancient Near East?”. Journal of the History of Biology. 8 (1): 95–114. doi:10.1007/BF00129597. PMID 11609871. ^ Kramer, SN (March 1954). “First pharmacopeia in man’s recorded history”. American Journal of Pharmacy and the Sciences Supporting Public Health. 126 (3): 76–84. ISSN 0002-9467. PMID 13148318. ^ Kramer SN, Tanaka H (March 1988). History Begins at Sumer: Thirty-Nine Firsts in Recorded History (3 ed.). Philadelphia: University of Pennsylvania Press. ISBN 978-0-8122-1276-1. ^ a b Terry CE, Pellens M (1928). “II: Development of the problem”. The Opium Problem. New York: Bureau of Social Hygiene. p. 54. Retrieved 2010-09-18. ^ Sonnedecker G (1962). “Emergence of the Concept of Opiate Addiction”. Journal Mondial de Pharmacie. 3: 275–290. ISSN 0021-8405. ^ a b c Anslinger HJ, Tompkins WF (1953). “The pattern of man’s use of narcotic drugs”. The Traffic in Narcotics. New York: Funk and Wagnalls. p. 1. ISBN 978-0-405-13567-5. Retrieved 2010-09-18. ^ a b Ludwig Christian Stern (1889). Ebers G, ed. Papyrus Ebers (in German). 2 (1 ed.). Leipzig: Bei S. Hirzel. OCLC 14785083. Retrieved 2010-09-18. ^ Pahor, AL (August 1992). “Ear, nose and throat in ancient Egypt: Part I”. The Journal of Laryngology & Otology. 106 (8): 677–87. doi:10.1017/S0022215100120560. PMID 1402355. Retrieved 2010-09-16. ^ Sullivan, R (August 1996). “The identity and work of the ancient Egyptian surgeon”. Journal of the Royal Society of Medicine. 89 (8): 467–73. doi:10.1177/014107689608900813. PMC 1295891. PMID 8795503. ^ Ebbell B (1937). The Papyrus Ebers: The greatest Egyptian medical document. Copenhagen: Levin & Munksgaard. Archived from the original on 26 February 2005. Retrieved 18 September 2010. ^ Bisset NG, Bruhn JG, Curto S, Halmsted B, Nymen U, Zink MH (January 1994). “Was opium known in 18th Dynasty ancient Egypt? An examination of materials from the tomb of the chief royal architect Kha”. Journal of Ethnopharmacology. 41 (1–2): 99–114. doi:10.1016/0378-8741(94)90064-7. PMID 8170167. ^ Kritikos PG, Papadaki SP (1967). “The history of the poppy and of opium and their expansion in antiquity in the eastern Mediterranean area”. Bulletin on Narcotics. 19 (3): 17–38. ISSN 0007-523X. Archived from the original on 2011-07-28. Retrieved 2010-09-18. ^ Sushruta (1907). “Introduction”. In Kaviraj Kunja Lal Bhishagratna. Sushruta Samhita, Volume1: Sutrasthanam. Calcutta: Kaviraj Kunja Lal Bhishagratna. pp. iv. Retrieved 2010-09-13. ^ Dwarakanath SC (1965). “Use of opium and cannabis in the traditional systems of medicine in India”. Bulletin on Narcotics. 17 (1): 15–9. ISSN 0007-523X. Archived from the original on 2011-07-28. Retrieved 2010-09-27. ^ Fort J (1965). “Giver of delight or Liberator of sin: Drug use and “addiction” in Asia”. Bulletin on Narcotics. 17 (3): 1–11. ISSN 0007-523X. Archived from the original on 2011-07-28. Retrieved 2010-09-27. ^ Giles L (transl.) (1912). Taoist teachings from the book of Lieh-Tzŭ, translated from the Chinese, with introduction and notes, by Lionel Giles (Wisdom of the East series). London: John Murray. Retrieved 2010-09-14. ^ a b c d e Chu NS (December 2004). “Legendary Hwa Tuo’s surgery under general anesthesia in the second century China” (PDF). Acta Neurologica Taiwanica (in Chinese). 13 (4): 211–6. ISSN 1028-768X. PMID 15666698. Archived from the original (PDF) on 26 February 2012. Retrieved 2010-09-18. ^ a b Giles HA (1898). A Chinese Biographical Dictionary. London: Bernard Quaritch. pp. 323–4, 762–3. Retrieved 2010-09-14. If a disease seemed beyond the reach of needles and cautery, he operated, giving his patients a dose of hashish which rendered them unconscious. ^ a b Giles L (transl.) (1948). Cranmer-Byng JL, ed. A Gallery of Chinese immortals: selected biographies, translated from Chinese sources by Lionel Giles (Wisdom of the East series) (1 ed.). London: John Murray. Retrieved 2010-09-14. The well-attested fact that Hua T’o made use of an anaesthetic for surgical operations over 1,600 years before Sir James Simpson certainly places him to our eyes on a pinnacle of fame…. ^ a b Chen J (August 2008). “A Brief Biography of Hua Tuo”. Acupuncture Today. 9 (8). ISSN 1526-7784. Retrieved 2010-09-18. ^ Wang Z; Ping C (1999). “Well-known medical scientists: Hua Tuo”. In Ping C. History and Development of Traditional Chinese Medicine. 1. Beijing: Science Press. pp. 88–93. ISBN 978-7-03-006567-4. Retrieved 2010-09-13. ^ Fu LK (August 2002). “Hua Tuo, the Chinese god of surgery”. Journal of Medical Biography. 10 (3): 160–6. doi:10.1177/096777200201000310. PMID 12114950. Archived from the original on 19 July 2009. Retrieved 2010-09-13. ^ Huang Ti Nei Ching Su Wen: The Yellow Emperor’s Classic of Internal Medicine. Translated by Ilza Veith. Berkeley, Los Angeles: University of California Press. 1972. p. 265. ISBN 978-0-520-02158-7. ^ a b Ch’en S (2000). “The Biography of Hua-t’o from the History of the Three Kingdoms”. In Mair VH. The shorter Columbia anthology of traditional Chinese literature. Part III: Prose. New York: Columbia University Press. pp. 441–9. ISBN 978-0-231-11998-6. Retrieved 2010-09-13. ^ Lu GD; Needham J (2002). “Acupuncture and major surgery”. Celestial lancets: a history and rationale of acupuncture and moxa. London: RoutledgeCurzon. pp. 218–30. ISBN 978-0-7007-1458-2. Retrieved 2010-09-13. ^ Wai, FK (2004). “On Hua Tuo’s Position in the History of Chinese Medicine”. The American Journal of Chinese Medicine. 32 (2): 313–20. doi:10.1142/S0192415X04001965. PMID 15315268. ^ Carroll E. (1997). “Coca: the plant and its use” (PDF). In Robert C. Petersen; Richard C. Stillman. Cocaine: 1977. United States Department of Health, Education, and Welfare, Public Health Service, Alcohol, Drug Abuse, and Mental Health Administration. p. 35. Archived from the original (PDF) on 4 November 2014. Retrieved 3 November 2014. ^ Peterson, RC (1997). “History of Cocaine” (PDF). In Robert C. Petersen; Richard C. Stillman. Cocaine: 1977. United States Department of Health, Education, and Welfare, Public Health Service, Alcohol, Drug Abuse, and Mental Health Administration. pp. 17–32. Archived from the original (PDF) on 4 November 2014. Retrieved 16 September 2010. ^ Rivera MA; Aufderheide AC; Cartmell LW; Torres CM; Langsjoen O (December 2005). “Antiquity of coca-leaf chewing in the south central Andes: a 3,000 year archaeological record of coca-leaf chewing from northern Chile”. Journal of Psychoactive Drugs. 37 (4): 455–8. doi:10.1080/02791072.2005.10399820. PMID 16480174. ^ Skinner, P (2008). “Unani-tibbi”. In Laurie J. Fundukian. The Gale Encyclopedia of Alternative Medicine (3rd ed.). Farmington Hills, Michigan: Gale Cengage. ISBN 978-1-4144-4872-5. Retrieved 2010-09-13. ^ Ajram K (1992). Miracle of Islamic Science (1 ed.). Vernon Hills, IL: Knowledge House Publishers. pp. Appendix B. ISBN 978-0-911119-43-5. Retrieved 2010-09-18. ^ Kritikos PG, Papadaki SP (1967). “The History of the Poppy and of Opium and Their Expansion in Antiquity in the Eastern Mediterranean Area”. Bulletin on Narcotics. 19 (4): 5–10. ISSN 0007-523X. ^ a b c d e Carter, Anthony J. (18 December 1999). “Dwale: an anaesthetic from old England”. BMJ. 319 (7225): 1623–1626. doi:10.1136/bmj.319.7225.1623. PMC 1127089. PMID 10600971. ^ Gravenstein JS (November–December 1965). “Paracelsus and his contributions to anesthesia”. Anesthesiology. 26 (6): 805–11. doi:10.1097/00000542-196511000-00016. PMID 5320896. Archived from the original on 2012-10-06. Retrieved 2010-09-20. ^ Priestley J (1775). Experiments and Observations on Different Kinds of Air. 1 (2 ed.). London: J. Johnson. pp. 108–29, 203–29. Retrieved 2010-09-13. ^ Levere, TH (July 1977). “Dr. Thomas Beddoes and the establishment of his Pneumatic Institution: a tale of three presidents”. Notes and Records of the Royal Society. 32 (1): 41–9. doi:10.1098/rsnr.1977.0005. JSTOR 531764. PMID 11615622. ^ Sneader W (2005). “Chapter 8: Systematic medicine”. Drug discovery: a history. Chichester, England: John Wiley and Sons. pp. 78–9. ISBN 978-0-471-89980-8. Retrieved 2010-09-13. ^ Davy H (1800). Researches, chemical and philosophical–chiefly concerning nitrous oxide or dephlogisticated nitrous air, and its respiration. Bristol: Biggs and Cottle. Retrieved 2010-09-18. ^ a b c Izuo, M (November 2004). “Medical history: Seishū Hanaoka and his success in breast cancer surgery under general anesthesia two hundred years ago”. Breast Cancer. 11 (4): 319–24. doi:10.1007/BF02968037. PMID 15604985. ^ Ogata T (November 1973). “Seishu Hanaoka and his anaesthesiology and surgery”. Anaesthesia. 28 (6): 645–52. doi:10.1111/j.1365-2044.1973.tb00549.x. PMID 4586362. ^ a b Hyodo M (1992). “Doctor S. Hanaoka, the world’s-first success in providing general anesthesia”. In Hyodo M, Oyama T, Swerdlow M. The Pain Clinic IV: proceedings of the fourth international symposium. Utrecht, Netherlands: VSP. pp. 3–12. ISBN 978-90-6764-147-0. Retrieved 2010-09-13. ^ a b van D., JH (2010). “Chosen-asagao and the recipe for Hanaoka’s anesthetic ‘tsusensan‘“. Brighton, UK: BLTC Research. Retrieved 2010-09-13. ^ Matsuki A (December 1999). “A bibliographical study on Shutei Nakagawa’s “Mayaku-ko” (a collection of anesthetics and analgesics)–a comparism of four manuscripts”. Nihon Ishigaku Zasshi (in Japanese). 45 (4): 585–99. ISSN 0549-3323. PMID 11624281. Archived from the original on 13 March 2012. Retrieved 2010-09-13. ^ Perrin, N (1979). Giving up the gun: Japan’s reversion to the sword, 1543–1879. Boston: David R. Godine. p. 86. ISBN 978-0-87923-773-8. Retrieved 2010-09-13. ^ a b Matsuki A (September 2000). “New studies on the history of anesthesiology–a new study on Seishū Hanaoka’s “Nyugan Ckiken Roku” (a surgical experience with breast cancer)”. Masui. 49 (9): 1038–43. ISSN 0021-4892. PMID 11025965. Retrieved 2010-09-13. ^ Tominaga, T (30 December 1994). “Presidential address: Newly established Japanese breast cancer society and the future”. Breast Cancer. 1 (2): 69–78. doi:10.1007/BF02967035. PMID 11091513. ^ Matsuki A (March 2002). “A Study on Seishu Hanaoka’s Nyugan Seimei Roku (Scroll of Diseases): A Name List of Breast Cancer Patients”. Nihon Ishigaku Zasshi (in Japanese). 48 (1): 53–65. ISSN 0549-3323. PMID 12152628. Archived from the original on 13 March 2012. Retrieved 2010-09-13. ^ Meyer, K (2004). “Dem Morphin auf der Spur”. Pharmazeutischen Zeitung (in German). GOVI-Verlag. Retrieved 2012-06-12. ^ Serturner FWA (1806). J. Pharm. f. Arzte. Apoth. Chem. 14, 47–93. ^ Serturner FWA (1817). Gilbert’s Annalen der Physik 25, 56–89. ^ Desai SP, Desai MS, Pandav CS (2007). “The discovery of modern anaesthesia-contributions of Davy, Clarke, Long, Wells and Morton”. Indian Journal of Anaesthesia. 51 (6): 472–8. ISSN 0019-5049. Retrieved 2010-09-18. ^ Sims JM (1877). “The Discovery of Anaesthesia”. Virginia Medical Monthly. 4 (2): 81–100. ^ a b Lyman HM (1881). “History of anaesthesia”. Artificial anaesthesia and anaesthetics. New York: William Wood and Company. p. 6. Retrieved 2010-09-13. ^ Lyman HM (September 1886). “The discovery of anesthesia”. Virginia Medical Monthly. 13 (6): 369–92. Retrieved 2010-09-13. ^ Richmond PA (1950). “Was William E. Clarke of Rochester the first American to use ether for surgical anesthesia?”. Genessee County Scrapbook of the Rochester Historical Society. 1: 11–3. ^ Stone RF (1898). Stone RF, ed. Biography of Eminent American Physicians and Surgeons (2 ed.). Indianapolis: CE Hollenbeck. p. 89. Retrieved 2010-09-13. ^ a b Long CW (December 1849). “An account of the first use of Sulphuric Ether by Inhalation as an Anaesthetic in Surgical Operations”. Southern Medical and Surgical Journal. 5: 705–13. reprinted in Long, C. W. (December 1991). “An account of the first use of Sulphuric Ether by Inhalation as an Anaesthetic in Surgical Operations”. Survey of Anesthesiology. 35 (6): 375. doi:10.1097/00132586-199112000-00049. ^ Wells, H (1847). A History of the Discovery of the Application of Nitrous Oxide Gas, Ether, and Other Vapors to Surgical Operations. Hartford: J. Gaylord Wells. Retrieved 2010-09-13. ^ a b Morton, WTG (1847). Remarks on the Proper Mode of Administering Sulphuric Ether by Inhalation (PDF). Boston: Button and Wentworth. OCLC 14825070. Retrieved 2010-09-13. ^ a b Fenster, JM (2001). Ether Day: The Strange Tale of America’s Greatest Medical Discovery and the Haunted Men Who Made It. New York: HarperCollins. ISBN 978-0-06-019523-6. ^ Jackson CT (1861). A Manual of Etherization: Containing Directions for the Employment of Ether. Boston: J.B. Mansfield. Retrieved 2010-09-13. ^ Northen WJ; Graves JT (1910). Men of Mark in Georgia: A Complete and Elaborate History of the State from Its Settlement to the Present Time, Chiefly Told in Biographies and Autobiographies of the Most Eminent Men of Each Period of Georgia’s Progress and Development. 2. Atlanta, Georgia: A.B. Caldwell. pp. 131–136. ^ Trendelenburg, F (1871). “Beiträge zu den Operationen an den Luftwegen” [Contributions to airways surgery]. Archiv für Klinische Chirurgie (in German). 12: 112–33. ^ Hargrave, R (June 1934). “Endotracheal Anæsthesia in Surgery of the Head and Neck”. Canadian Medical Association Journal. 30 (6): 633–7. PMC 403396. PMID 20319535. ^ Wawersik, J (May–June 1991). “History of anesthesia in Germany”. Journal of Clinical Anesthesia. 3 (3): 235–244. doi:10.1016/0952-8180(91)90167-L. PMID 1878238. Retrieved 2010-09-13. ^ Bain, JA; Spoerel, WE (November 1964). “Observation on the use of cuffed tracheostomy tubes (with particular reference to the James tube)”. Canadian Anaesthetists’ Society Journal. 11 (6): 598–608. doi:10.1007/BF03004104. PMID 14232175. ^ Macewen, W (July 1880). “General Observations on the Introduction of Tracheal Tubes by the Mouth, Instead of Performing Tracheotomy or Laryngotomy”. British Medical Journal. 2 (1021): 122–4. doi:10.1136/bmj.2.1021.122. PMC 2241154. PMID 20749630. ^ Macewen, W (July 1880). “Clinical Observations on the Introduction of Tracheal Tubes by the Mouth, Instead of Performing Tracheotomy or Laryngotomy”. British Medical Journal. 2 (1022): 163–5. doi:10.1136/bmj.2.1022.163. PMC 2241109. PMID 20749636. ^ Macmillan, M (May 2010). “William Macewen [1848–1924]”. Journal of Neurology. 257 (5): 858–9. doi:10.1007/s00415-010-5524-5. PMID 20306068. ^ García, M (24 May 1855). “Observations on the Human Voice”. Proceedings of the Royal Society of London. 7: 399–410. doi:10.1098/rspl.1854.0094. Retrieved 2010-09-13. ^ Hack, W (1878). “Über die mechanische Behandlung der Larynxstenosen” [On the mechanical treatment of laryngeal stenosis]. Sammlung Klinischer Vorträge (in German). 152: 52–75. ^ Hack, W (March 1878). “Über einen fall endolaryngealer exstirpation eines polypen der vorderen commissur während der inspirationspause”. Berliner Klinische Wochenschrift (in German): 135–7. Retrieved 2010-09-13. ^ Hirsch, NP; Smith, GB; Hirsch, PO (January 1986). “Alfred Kirstein. Pioneer of direct laryngoscopy”. Anaesthesia. 41 (1): 42–5. doi:10.1111/j.1365-2044.1986.tb12702.x. PMID 3511764. ^ Mackenzie, M (1888). The case of Emperor Frederick III. : full official reports by the German physicians and by Sir Morell Mackenzie. New York: Edgar S. Werner. p. 276. Retrieved 2010-09-13. ^ a b Burkle, CM; Zepeda, FA; Bacon, DR; Rose, SH (April 2004). “A historical perspective on use of the laryngoscope as a tool in anesthesiology”. Anesthesiology. 100 (4): 1003–6. doi:10.1097/00000542-200404000-00034. PMID 15087639. ^ Fischer EH; Mering J (March 1903). “Ueber eine neue Klasse von Schlafmitteln”. Die Therapie der Gegenwart (in German). 5: 97–101. Retrieved 2010-09-13. ^ Jackson, C (1913). “The technique of insertion of intratracheal insufflation tubes”. Surgery, Gynecology & Obstetrics. 17: 507–9. Reprinted in Jackson, Chevalier (May 1996). “The technique of insertion of intratracheal insufflation tubes”. Pediatric Anesthesia. 6 (3): 230. doi:10.1111/j.1460-9592.1996.tb00434.x. ^ Zeitels, S (March 1998). “Chevalier Jackson’s contributions to direct laryngoscopy”. Journal of Voice. 12 (1): 1–6. doi:10.1016/S0892-1997(98)80069-6. PMID 9619973. ^ Jackson, C (1922). “I: Instrumentarium” (PDF). A manual of peroral endoscopy and laryngeal surgery. Philadelphia: W.B. Saunders. pp. 17–52. ISBN 978-1-4326-6305-6. Retrieved 2010-09-13. ^ Janeway, HH (November 1913). “Intra-tracheal anesthesia from the standpoint of the nose, throat and oral surgeon with a description of a new instrument for catheterizing the trachea”. The Laryngoscope. 23 (11): 1082–90. doi:10.1288/00005537-191311000-00009. ^ Tabern, DL; Volwiler, EH (October 1935). “Sulfur-containing barbiturate hypnotics”. Journal of the American Chemical Society. 57 (10): 1961–3. doi:10.1021/ja01313a062. ^ Eisleb, 0. & Schaumann, 0. (1939) Deutsche Medizinische Wochenschrift 65, 967-968. ^ Rowbotham, ES; Magill, I (1921). “Anæsthetics in the Plastic Surgery of the Face and Jaws”. Proceedings of the Royal Society of Medicine. 14 (Sect Anaesth): 17–27. PMC 2152821. PMID 19981941. ^ Magill, I (14 July 1923). “The provision for expiration in endotracheal insufflations anaesthesia”. The Lancet. 202 (5211): 68–9. doi:10.1016/S0140-6736(01)37756-5. ^ Magill, I (December 1928). “Endotracheal Anæsthesia”. Proceedings of the Royal Society of Medicine. 22 (2): 85–8. PMC 2101959. PMID 19986772. ^ Magill, I (November 1930). “Technique in Endotracheal Anaesthesia”. British Medical Journal. 2 (1243): 817–9. doi:10.1136/bmj.2.1243.817-a. PMC 2451624. PMID 20775829. ^ Thomas, KB (Jul–Aug 1978). “Sir Ivan Whiteside Magill, KCVO, DSc, MB, BCh, BAO, FRCS, FFARCS (Hon), FFARCSI (Hon), DA. A review of his publications and other references to his life and work”. Anaesthesia. 33 (7): 628–34. doi:10.1111/j.1365-2044.1978.tb08426.x. PMID 356665. ^ McLachlan, G (September 2008). “Sir Ivan Magill KCVO, DSc, MB, BCh, BAO, FRCS, FFARCS (Hon), FFARCSI (Hon), DA, (1888–1986)”. Ulster Medical Journal. 77 (3): 146–52. PMC 2604469. PMID 18956794. ^ Magill, I (October 1920). “Appliances and Preparations”. British Medical Journal. 2 (3122): 670. doi:10.1136/bmj.2.571.670. PMC 2338485. PMID 20770050. ^ Magill, I (6 March 1926). “An improved laryngoscope for anaesthetists”. The Lancet. 207 (5349): 500. doi:10.1016/S0140-6736(01)17109-6. ^ Magill, I (30 April 1921). “A Portable Apparatus for Tracheal Insufflation Anaesthesia”. The Lancet. 197 (5096): 918. doi:10.1016/S0140-6736(00)55592-5. ^ Magill, I (11 June 1921). “Warming Ether Vapour for Inhalation”. The Lancet. 197 (5102): 1270. doi:10.1016/S0140-6736(01)24908-3. ^ Magill, I (4 August 1923). “An apparatus for the administration of nitrous oxide, oxygen, and ether”. The Lancet. 202 (5214): 228. doi:10.1016/S0140-6736(01)22460-X. ^ Gravenstein, Joachim (January 1998). “Henry K. Beecher : The Introduction of Anesthesia into the University”. Anesthesiology. 88 (1): 245–253. doi:10.1097/00000542-199801000-00033. PMID 9447878. ^ Macintosh, RR (13 February 1943). “A new laryngoscope”. The Lancet. 241 (6233): 205. doi:10.1016/S0140-6736(00)89390-3. ^ Scott, J; Baker, PA (July 2009). “How did the Macintosh laryngoscope become so popular?”. Paediatric Anaesthesia. 19 (Suppl 1): 24–9. doi:10.1111/j.1460-9592.2009.03026.x. PMID 19572841. ^ Macintosh, RR (1 January 1949). “Marxist Genetics”. British Medical Journal. 1 (4591): 26–28. doi:10.1136/bmj.1.4591.26-b. PMC 2049235. ^ Venn, PH (March 1993). “The gum elastic bougie”. Anaesthesia. 48 (3): 274–5. doi:10.1111/j.1365-2044.1993.tb06936.X. ^ Viswanathan, S; Campbell, C; Wood, DG; Riopelle, JM; Naraghi, M (November–December 1992). “The Eschmann Tracheal Tube Introducer. (Gum elastic bougie)”. Anesthesiology Review. 19 (6): 29–34. PMID 10148170. ^ Henderson, JJ (January 2003). “Development of the ‘gum-elastic bougie‘“. Anaesthesia. 58 (1): 103–4. doi:10.1046/j.1365-2044.2003.296828.x. PMID 12492697. ^ Stanley, TH; Egan, TD; Van Aken, H (February 2008). “A Tribute to Dr. Paul A. J. Janssen: Entrepreneur Extraordinaire, Innovative Scientist, and Significant Contributor to Anesthesiology”. Anesthesia & Analgesia. 106 (2): 451–62. doi:10.1213/ane.0b013e3181605add. PMID 18227300. ^ Janssen, PA; Niemegeers, CJ; Schellekens, KH; Verbruggen, FJ; Van Nueten, JM (March 1963). “The pharmacology of dehydrobenzperidol, a new potent and short acting neuroleptic agent chemically related to Haloperidol”. Arzneimittel-Forschung. 13: 205–11. PMID 13957425. ^ de Castro J, Mundeleer P (1959). “Anesthésie sans barbituriques: la neuroleptanalgésie”. Anesthésie, Analgésie, Réanimation (in French). 16: 1022–56. ISSN 0003-3014. ^ Nilsson E, Janssen PA (1961). “Neurolept-analgesia: an alternative to general anesthesia”. Acta Anaesthesiologica Scandinavica. 5 (2): 73–84. doi:10.1111/j.1399-6576.1961.tb00085.x. ISSN 0001-5172. PMID 13729171. ^ Aubry, U; Carignan, G; Chare-Tee, D; Keeri-Szanto, M; Lavallee, JP (May 1966). “Neuroleptanalgesia with fentanyl-droperidol: An appreciation based on more than 1000 anaesthetics for major surgery”. Canadian Anaesthetists’ Society Journal. 13 (3): 263–71. doi:10.1007/BF03003549. PMID 5961929. ^ Corssen, G; Domino, EF; Sweet, RB (November–December 1964). “Neuroleptanalgesia and Anesthesia”. Anesthesia & Analgesia. 43 (6): 748–63. doi:10.1213/00000539-196411000-00028. PMID 14230731. ^ Reyes JC, Wier GT, Moss NH, Romero JB, Hill R (September 1969). “Neuroleptanalgesia and anesthesia: Experiences in 60 poor risk geriatric patients”. South Dakota Journal of Medicine. 22 (9): 31–3. PMID 5259472. ^ J., PA; Eddy, NB (February 1960). “Compounds Related to Pethidine–IV. New General Chemical Methods of Increading the Analgesic Activity of Pethidine”. Journal of Medicinal Chemistry. 2 (1): 31–45. doi:10.1021/jm50008a003. PMID 14406754. ^ Janssen, PA; Niemegeers, CJ; Dony, JG (1963). “The inhibitory effect of fentanyl and other morphine-like analgesics on the warm water induced tail withdrawal reflex in rats” (PDF). Arzneimittel-Forschung. 13: 502–7. PMID 13957426. ^ Niemegeers, CJ; Schellekens, KH; Van Bever, WF; Janssen, PA (1976). “Sufentanil, a very potent and extremely safe intravenous morphine-like compound in mice, rats and dogs”. Arzneimittel-Forschung. 26 (8): 1551–6. PMID 12772. ^ Spierdijk J, van Kleef J, Nauta J, Stanley TH, de Lange S (1980). “Alfentanil: a new narcotic induction agent”. Anesthesiology. 53: S32. doi:10.1097/00000542-198009001-00032. ^ Niemegeers CJ, Janssen PA (1981). “Alfentanil (R39209)-a particularly short acting intravenous narcotic analgesic in rats”. Drug Development Research. 1: 830–8. doi:10.1002/ddr.430010111. ISSN 0272-4391. ^ De Vos, V (22 July 1978). “Immobilisation of free-ranging wild animals using a new drug”. Veterinary Record. 103 (4): 64–8. doi:10.1136/vr.103.4.64. PMID 685103. ^ Laduron, P; Janssen, PF (August 1982). “Axoplasmic transport and possible recycling of opiate receptors labelled with 3H-lofentanil”. Life Sciences. 31 (5): 457–62. doi:10.1016/0024-3205(82)90331-9. PMID 6182434. ^ Doenicke A, Kugler J, Penzel G, Laub M, Kalmar L, Kilian I, Bezecny H (August 1973). “[Cerebral function under etomidate, a new non-barbiturate i.v. hypnotic]”. Anaesthesist (in German). 22 (8): 353–66. ISSN 0003-2417. PMID 4584133. Archived from the original on 20 July 2011. Retrieved 2010-09-27. ^ Morgan, M; Lumley, Jean; Whitwam, J.G. (26 April 1975). “Etomidate, a New Water-Soluble Non-barbiturate Intravenous Induction Agent”. The Lancet. 305 (7913): 955–6. doi:10.1016/S0140-6736(75)92011-5. PMID 48126. ^ Murphy, P (July 1967). “A fibre-optic endoscope used for nasal intubation”. Anaesthesia. 22 (3): 489–91. doi:10.1111/j.1365-2044.1967.tb02771.x. PMID 4951601. ^ Wheeler M and Ovassapian A (2007). “Chapter 18: Fiberoptic endoscopy-aided technique”. In Benumof, JL. Benumof’s Airway Management: Principles and Practice (2nd ed.). Philadelphia: Mosby-Elsevier. p. 423. ISBN 978-0-323-02233-0. Retrieved 2010-09-13. ^ Agrò, F; Barzoi, G; Montecchia, F (May 2003). “Tracheal intubation using a Macintosh laryngoscope or a GlideScope in 15 patients with cervical spine immobilization”. British Journal of Anaesthesia. 90 (5): 705–6. doi:10.1093/bja/aeg560. PMID 12697606. ^ Cooper, RM; Pacey, JA; Bishop, MJ; McCluskey, SA (February 2005). “Early clinical experience with a new videolaryngoscope (GlideScope) in 728 patients”. Canadian Journal of Anesthesia. 52 (2): 191–8. doi:10.1007/BF03027728. PMID 15684262. ^ Tonner, PH (August 2006). “Xenon: one small step for anaesthesia…? (editorial review)”. Current Opinion in Anesthesiology. 19 (4): 382–4. doi:10.1097/01.aco.0000236136.85356.13. PMID 16829718. Retrieved 2010-09-15. Goldsmith, WM (1945). “Trepanation and the ‘CatlinMark‘“. American Antiquity. 10 (4): 348–52. doi:10.2307/275576. JSTOR 275576. Guerra Doce, E (2006). “Evidencias del consumo de drogas en Europa durante la Prehistoria”. Trastornos Adictivos (in Spanish). 8 (1): 53–61. doi:10.1016/S1575-0973(06)75106-6. Retrieved 2010-11-14. Gurlt, EJ (1898). “VI: Volkschirurgie in Japan in alter und neuerer”. Geschichte der Chirurgie und ihrer Ausübung (in German). 1. Berlin: Verlag von August Hirschwald. p. 83. Retrieved 2010-11-14. Hrdlicka, A (1939). “Trepanation among prehistoric people, especially in America”. Ciba Foundation Symposium. 1 (6): 170–7. Matsuki, A (2005). “A brief history of the biographical study of Seishu Hanaoka”. Nihon Ishigaku Zasshi (in Japanese). 51 (3): 355–84. ISSN 0549-3323. PMID 16450478. Retrieved 2010-11-14. Matsuki, A (2006). “Why did Hanaoka’s Method of Anesthesia Decay Rapidly at the End of the Edo Period?”. Nihon Ishigaku Zasshi (in Japanese). 52 (1): 40–1. ISSN 0549-3323. Ruffer, MA (1918). “Studies in paleopathology. Some recent researches on prehistoric trephining”. Journal of Pathology and Bacteriology. 22: 90–104. doi:10.1002/path.1700220109. Stewart, TD (1958). “Stone Age skull surgery. A general review with emphasis on the New World”. Smithsonian Annual Report of the Board of Regents, 1957. pp. 469–91. “The secret anesthetic used in the repair of a hare-lip performed by Tokumei Takamine in Ryukyu”. Matsuki A. Nippon Ishigaku Zasshi. October 1985 31(4):463-89. Japanese. Wood Library-Museum of Anesthesiology The most comprehensive educational, scientific and archival resources in anesthesiology. “Chloroform: The molecular lifesaver“ An article at University of Bristol providing interesting facts about chloroform. (in German) Die Geschichte der Anästhesie. “Anesthesia as a specialty: Past, present and future” Presentation by Prof. Janusz Andres.